Each restoration may take two to three visits to complete. Jim’s work, usually accompanied by his faithful companion Malaika, is his way of giving back to the community. As of last summer, Carn’s restorations had passed the 70 mark. The three-step process includes first scraping, then applying two coats of blue and two coats of yellow. No funding was set aside to maintain Keystone Markers, so many are weather-weary after spending nearly a century out in the elements. Over the past five years Williamsport district judge Jim Carn has crisscrossed eight Pennsylvania counties, averaging 1,600 miles each year. But his travels have nothing to do with meting out first-level justice. Jim’s personal travels, usually accompanied by his faithful companion Malaika (long ago his daughter’s dog), are his way of giving back to the community. “I like things to look nice. It dresses up a town – they’re like ambassadors for people coming through,” says Jim. His personal passion also fits in nicely with his appreciation of history, especially American history. What Jim does on summer nights and weekends, on his own time and his own dime, is restore old Keystone Markers, wherever he finds them. 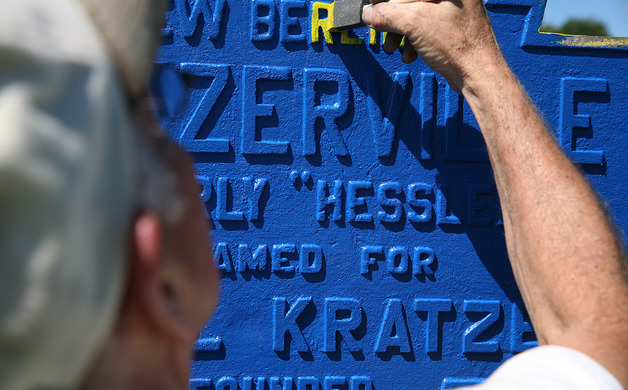 As of last summer, Carn’s restorations—from Wellsboro to Towanda and Rupert to Kratzerville— and dozens of dots on the map in between, had passed the 70 mark. Keystone Markers were placed by the hundreds across the Keystone State in the 1920s by the then-Pennsylvania Department of Highways to denote streams, rivers and towns along the burgeoning network of state highways as Governor Gifford Pinchot “got the farmers out of the mud.” Two foundries, one in Waynesboro, the other in Carlisle, turned out some 2,000 cast-iron markers. Today, it is believed around 800 remain. There was never any funding set aside to maintain these sentries; many are weather-weary, having spent nearly a century out in the elements. 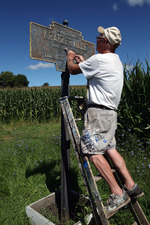 Ambling up a rickety step ladder splattered with years of paint drippings, Jim (sporting matching splattered shorts) first scrapes, sands or wire-brushes the remnants of decades-old paint and rust from each marker he addresses. 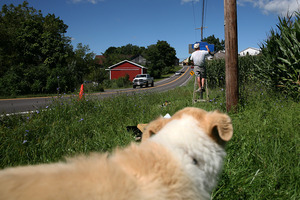 In Kratzerville, with Malaika silently looking on from the shadow of his truck, Jim meticulously carries out the routine he has developed since the summer of 2009 when he worked on his first marker in Waterville, Lycoming County. Each sign gets a thorough scraping, then two coats of blue paint, followed by two coats of yellow for the borders and lettering. With the lettering, Jim always paints the dash first. Depending on the conditions and circumstances, each location may take two or three visits to complete the work. Carn has no idea how much he has invested in the endeavor, but he estimates he’s gone through about 10 gallons of blue paint and significantly less yellow. The blue and yellow colors were researched by historian Nathanial Guest to match the original state colors. Jim gets his supply through Fink’s Paint Store in Williamsport. “Mike Fink has been very generous; he’s given me several gallons of paint,” noted Jim. 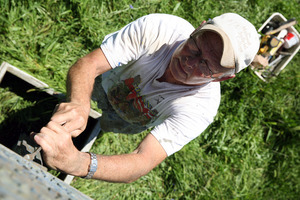 Carn figures he invests about 10 to 12 hours working at a two-sign town like Kratzerville. If you’re wondering what he gets out of it, Jim looks at it this way: “I’ve been to a lot of places I’ve never been before. I’ve met a lot of great people along the way; many stop to say thanks. Usually, people wave as they pass by and use all five fingers since they don’t know me,” he jokes. 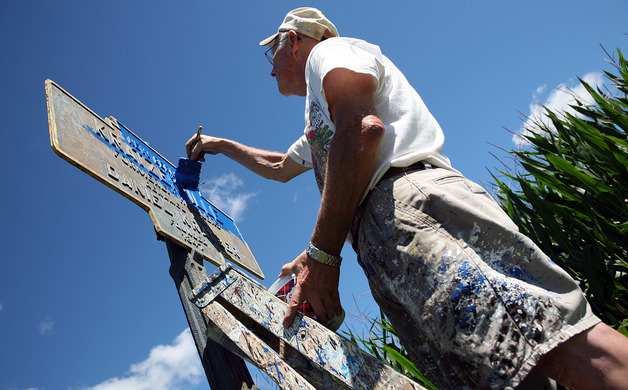 “Some toot the horn; in Rupert one guy gave me banana nut bread and coffee.” His most unusual encounter was with the gentleman from New York State who stopped by when Jim was repainting the markers along Route 45 at Vicksburg, Union County. The guy wanted to know where the Civil War battlefield was. Jim had a tough time convincing him this was not Mississippi (where that battle actually took place). One thing he has learned: he wouldn’t want to be doing this—working along the roads—every day. “It’s not so bad here along Route 204 at Kratzerville, but people drive way too fast.” He added it has given him a new respect for highway workers. In that case, many more of the region’s towns are likely to benefit from Jim Carn’s generosity. Rick Mason, of Williamsport, is a communications professional and has worked as a journalist, public information officer, freelance writer, portrait photographer and community volunteer.